One of the supporting characters in Casanova is Ruby, a robot designed by Sabine Seychelle as a Blade Runner-style sexbot. Casanova rescues Ruby from her intended life of sexual servitor servitude; she meets and falls in love with Casanova’s protégé Katio. A dozen issues later, Ruby is killed when their base is invaded, but the whole invasion is revealed to have been a ploy. The only people in the base were robots so it could all look like a real battle without any loss of life. In issue 13, Sabine comes to Katio to say that they’re ready to reboot Ruby from a backup. Kaito shocks Sabine by saying he’d instead like for them to arrange for a memorial service. Kaito refuses to let them bring Ruby back to life. He loved her, and he feels that death is part of life. At the memorial Kaito is so broken up he can’t even hear the words being spoken. They’re just empty word bubbles. Then, finally, some of the surrounding dialogue does break through. Even though no one understands, Kaito insists that Ruby be allowed to stay dead so he can be allowed to mourn her. It’s such a strange predicament! 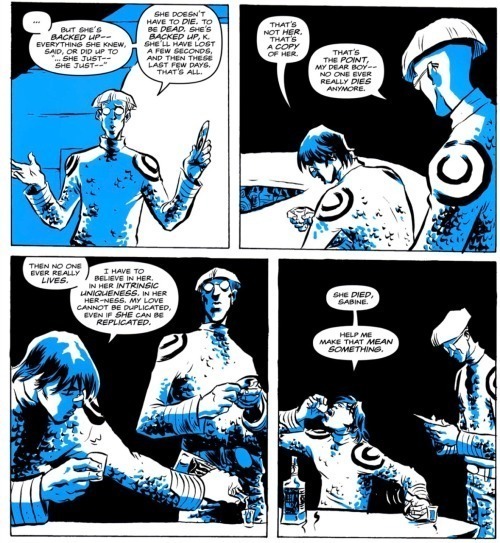 Where else but a sci-fi comic book with robot girlfriends could you have this kind of opportunity to ruminate on the necessary permanence of death to contexualize life and love! Well, maybe in a sci-fi comic book with robot boyfriends. More Than Meets the Eye, over the course of its first fifteen issues, depicts a friendship between characters Rewind and Chromedome. As the book goes along, you see that their relationship has moved beyond friendship to something deeper. The love these two characters share for one-another is truly one of the most touching, wonderful things I’ve ever read in a comic. I adore Chromedome and Rewind. I still have the Rewind I had when I was a kid. The most recent editions of their toys are sitting on my desk right now. At the end of the fifteenth issue, Rewind is killed. Issue 16 deals with the aftermath of this and focuses on Chromedome’s grief. 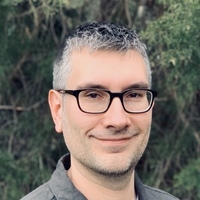 Chromedome by trade is a “mnemosurgeon,” meaning he has the ability to probe other bots’ memories and even change them. After Rewind dies, Brainstorm comes to check on Chromedome. He’s worried about him, and he knows that Chromedome has been in mourning before and hasn’t ever dealt with it properly. Brainstorm is worried that Chromedome is going to use his abilities as a mnemosurgeon to remove his memories of Rewind, or at least his feelings. Needless to say, this isn’t healthy. The closest analogue we have in real life would be someone drinking to try to deaden feelings of loss. Here we have a character who’s literally able to forget his pain. The issue of loss is further compacted by a major point of tension in Rewind and Chromedome’s relationship. Rewind used to be in a relationship with Dominus Ambus, who went missing many years ago. For the duration of their friendship and subsequent romance, Chromedome has been trying to cope with jealousy of Rewind’s relationship with Dominus. Will he ever be good enough? What if Dominus is ever found alive? Now we find out how one-sided this facet of their relationship was. Chromedome can’t relate to the idea that you can love your current partner while still caring for your ex because he’s been erasing his own memories of his exes! As 16 goes on, Chromedome discovers a message that Rewind sent him right before he was killed and decides to not go through with it, allowing him to start to properly grieve for him. Rounding out my exploration here of loss and grief, we have recent events in MTMtE’s followup book, Transformers: Lost Light. The book started by introducing us to two new characters, Anode and Lug. We learn that Lug has died but Anode is able to bring her back to life using an I think somewhat suspicious procedure where tiny traces of consciousness were taken and implanted in a newly-grown body (I’m skipping over tons of technobabble here). Then, a few issues later, Nautica is trying to resurrect Skids despite having only his brain module. Both forms of resurrection seem a little too easy for me to believe this is all going to turn out okay. 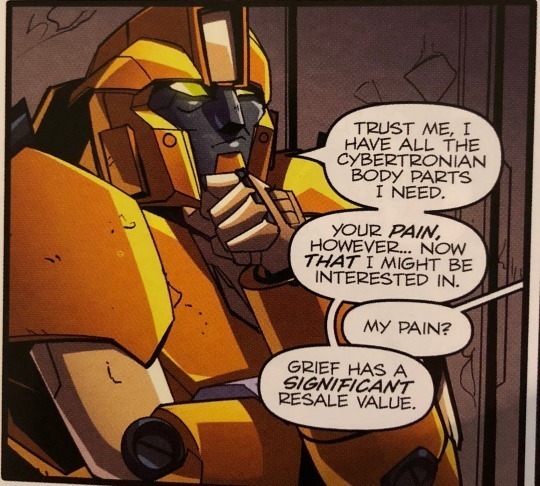 In the most recent issue of Lost Light, number 9, Nautica seems to have found someone with the ability to bring Skids back to life, but he wants a terrible price. Nautica can’t afford the procedure that would resurrect Skids, but the back alley specialist offers to buy her grief for Skids as payment. It’s an interesting counterpoint to Kaito’s refusal to allow Ruby to be resurrected because he feels his love for her and the necessary grief is essential to his humanity. 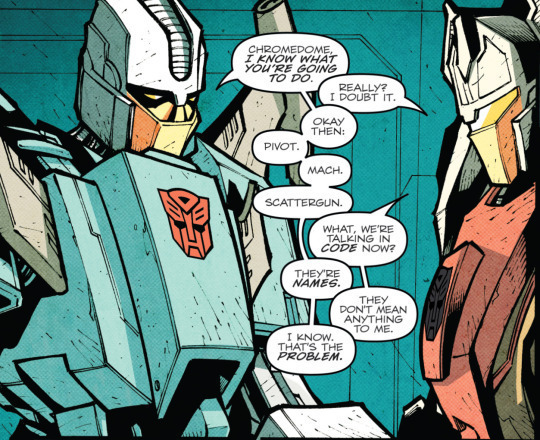 Here we have Nautica doing more or less the opposite: she’s willing to sell off her friendship with Skids in order to get him back. He’d be alive but she wouldn’t think of him as anything but a stranger. Moreover, as events progress the price gets raised, and Nautica is asked to also sell her friendship with Velocity. 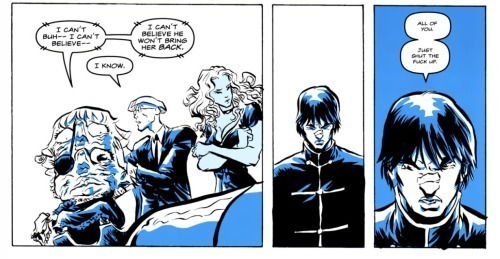 Some stuff happens, they get attacked during the procedure, and Nautica cuts it short and help Velocity, choosing to save her both the actual Velocity and her memories of their friendship. As the issue ends it seems that, while Skids wasn’t resurrected, Nautica’s feelings of friendship and grief for him have been taken away. What I love about each of the examples I’ve highlighted here is the way the sci-fi trappings take their time to set up these complicated scenarios that play on everything you’ve been reading for dozens of issues, all to wind up showing us very basic, human truths. Which is of course the point of sci-fi in the first place.